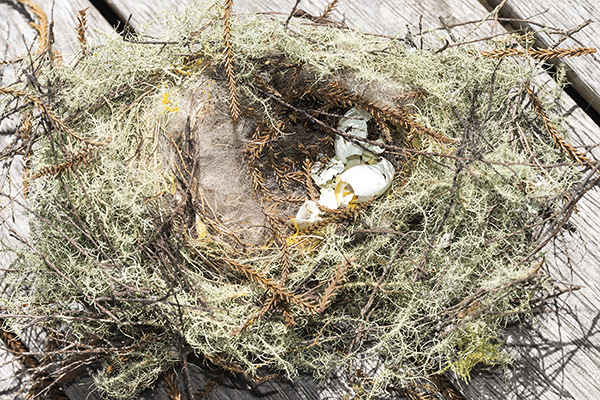 Lichen is a favoured nest building material, together with twigs and fine dried grasses. Females exclusively are said to build the nest. 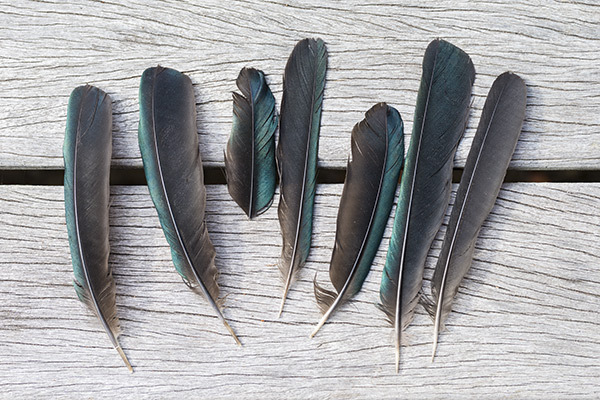 A selection of Tui feathers from our lawn - presumably plucked by large strong males guarding their territory. 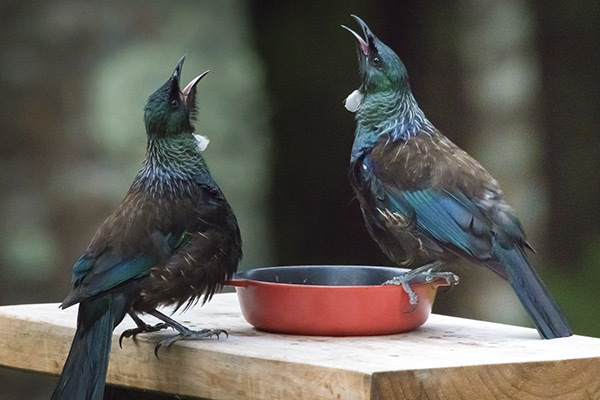 Not all competitive behavior is so violent, Tui also indulge in singing duals. 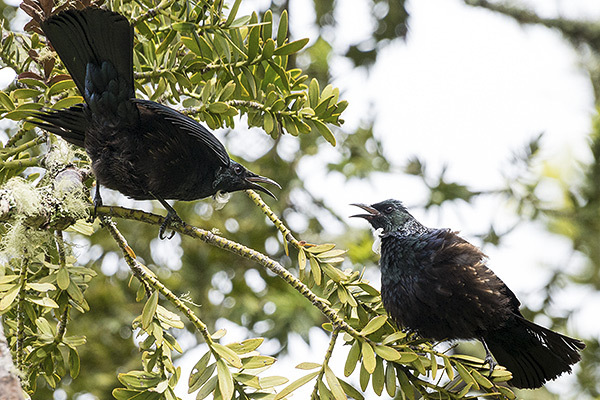 Now it has to be acknowledged that when we see two Tui singing at one another, we can’t really say with any certainty that it’s two males. Given that males and females are very similar, almost identical in fact, it could be the duet of a courting couple. However it is not unusual in these situations, to see a third smaller Tui closely observing the performance nearby. Female Tui are especially attracted to, not only large males with prominent white poi feathers, but also to a powerful and diverse song. Apparently, not only can this type of competitive behavior be designed to win a nesting partner, but also to win away a female from an existing and active nesting partnership. 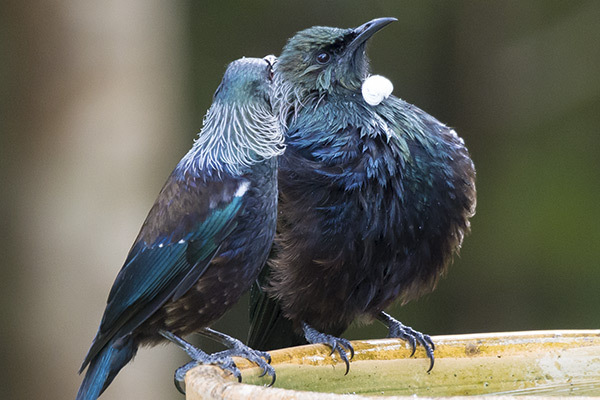 Tui are notoriously promiscuous, especially for a supposedly monogamous bird. 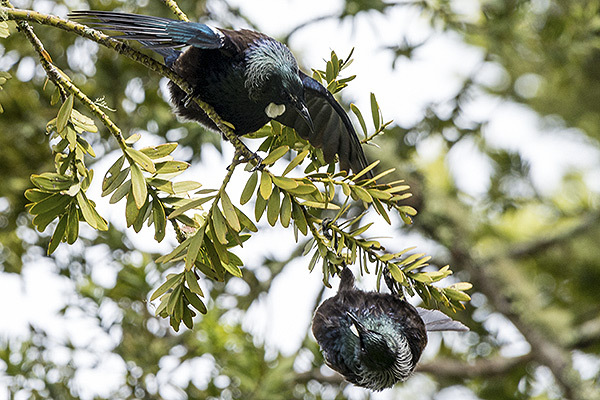 A recent four year study and DNA testing of about 390 adult Tui and 56 chicks by Sarah Wells of Massey University at Tawharanui Regional Park, north of Auckland, showed that in fact females engage in what are known as extra-pair copulations (EPCs) with males that are not their partners, producing clutches of mixed paternity. 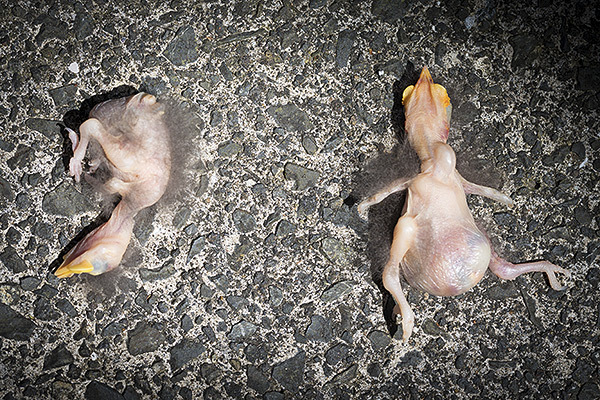 In fact up to 57 percent of all chicks studied were found to be fathered by males that are not their partners, producing clutches of mixed paternity. For more info CLICK HERE. 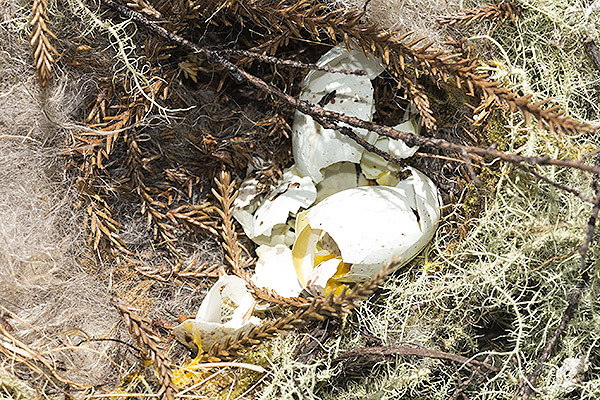 Other evidence from around our home such as eggs and chicks on the ground seems to indicate that there is a certain amount of nesting destruction possibly by aggressive males in order to prevent future competition for food and females in their territory. Whodunnit? An entire nest found on our deck one morning. Did it fall due to inadequate nest building technique - or was it deliberately dislodged? 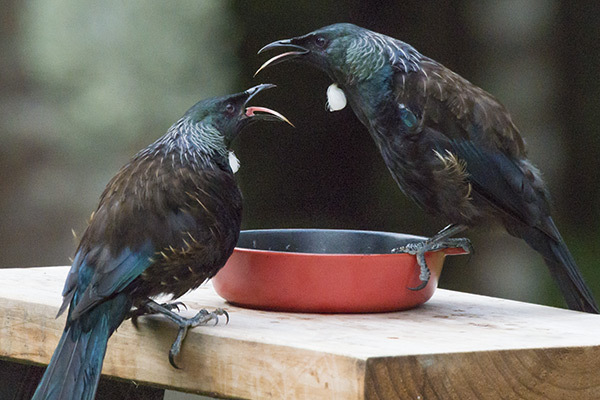 It may seem to us that the world of the Tui is characterised by mayhem and maliciousness, disorder and anarchy. In reality though, there is a system behind all these actions and it is fundamental to nature itself - survival of the fittest perhaps. It's tough to survive in the wild, especially in the winter months of minimum food resources. The pressure from predators and competition for food resources from other species has never been greater. 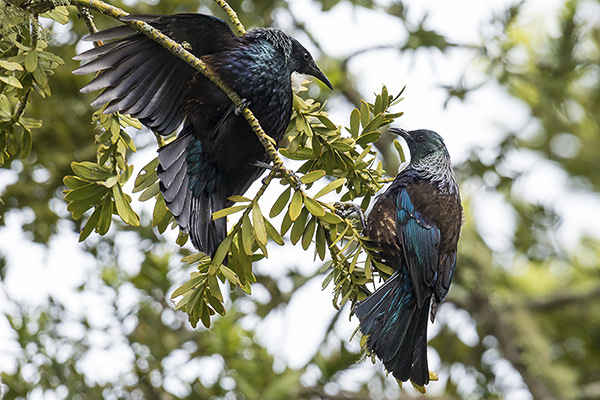 Tui as a species has to become stronger to survive and in fact, they do this very well. They are one of a few native birds for which there is no fear for their survival currently. They have learned to adapt to the current world and are prospering.